Your Sunday Date. Fireside Theater. The Lone Ranger. Buddy and Ginger. Little Orphan Annie. Charlie Chan. Marriage License Romances. If you lived in Chicagoland in 1937, chances are good you listened to WGN Radio and some, or all, of the shows above. (On Marriage License Romances the host interviewed couples who were applying for marriage licenses!) Already possessing a good signal, WGN was interested in expanding their range to draw in more listeners. As part of a million-dollar plan, WGN made a commitment to boost their broadcast signal and to build a new studio headquarters. The first order of business in erecting a new transmitting tower was to find a suitable site. The current transmitting site was in Elgin and they employed a “T” type antenna system which used two 250 foot towers with wires stretching between them that served as antennas. The new system that was planned for the new site was a single 750 foot tower that was inverted to rest on a pin point, electrified porcelain insulator. The result was that the entire tower served as the antenna, a revolutionary idea at the time. Certain criteria had to be met, though, for the placement of the tower. It was necessary that the subsoil be clay-based with very little ore, gravel or sand so that the tower would be well anchored. In the unlikely event that the tower would topple (it was guaranteed to withstand 110 mph winds) it was necessary to be in an open plot of land, large enough to accommodate a fallen tower. It also needed to be off of regular air routes and in a sparsely populated area, eliminating any possible interference from nearby transmitters. The location they found was the farm of Regina Thies, off of Rohlwing Road (old Route 53), two miles north of Irving Park Road. The farm had every quality WGN was looking for. The subsoil was perfect, the location was five miles from any air traffic and there were less than 4000 people in a five mile radius. In addition, the Thies family was motivated to sell their 100 acre farm. Regina’s husband, Herman, had passed away in 1909 and after farming for nearly 30 years, she and her family were ready to move on. After approval was granted by the FCC on October 12, 1937, construction began in April 1938. Truscon Steel of Youngstown, Ohio fabricated the tower, and steel workers bolted and welded the tower in segments. By mid-May a 400-foot span was in place. Nearly two weeks later, the entire 750 foot structure was completed and held in place by anchoring wires at 300 and 500 feet that created an incredible downpull on the structure. The WGN tower was now the tallest man-made structure in the midwest. In addition, part of the $250,000 budget included the construction of a transmitter house. This simple structure was built in the Art Deco style of the Depression and exists today on the property. It was originally designed to keep a broadcast on the air in the event of electrical, mechanical or human failure. If the power supply failed, a selector switch in the building would be flipped to trigger an auxiliary or emergency line. Upon completion of the project, the master control board in the transmitter house would always be occupied by an operator or technician. Also included in the building were living quarters for the workers so that transmission could continue unimpeded should any emergency occur. Transformers were positioned on two large concrete bunkers to supply electricity to power the transmitter. The electricity came from two power lines that stretched over many miles from both the Waukegan and Maywood substations. 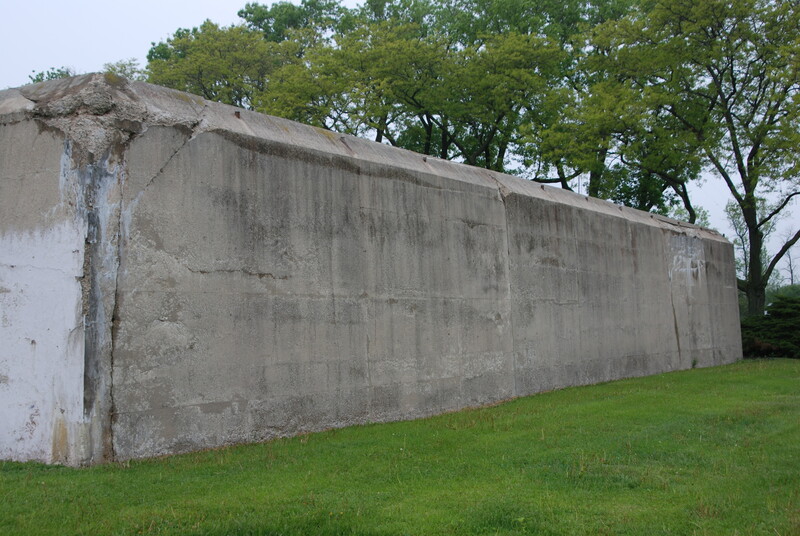 This bunker still exists on the property today. 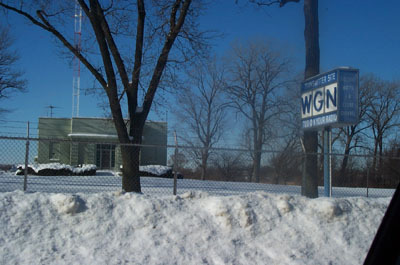 The transmitter went into operation on March 29, 1939, which was also the 15th anniversary of the founding of WGN radio. Reception was vastly improved throughout the entire midwest, reaching as far north as the upper Michigan peninsula. The signal was so good, in fact, that Henry Thies, who lived on a neighboring farm, could sometimes catch the radio station being transmitted through the steel spring support underneath the mattress on his steel frame bed. Imagine laying in bed, trying to get to sleep after a hard day’s work, and having your rest disrupted by music or a comedy show broadcast on a bed that had become a large radio! 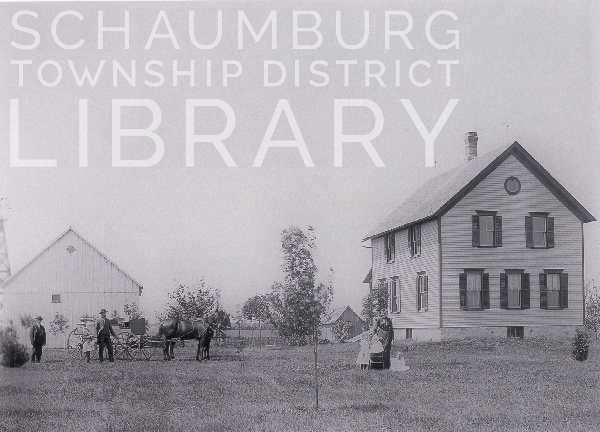 This year will be the 80th anniversary of the placement of the WGN tower in Schaumburg Township. Back in 1938, this would have been the view looking west from the transmitter towards the Henry Thies farm. Obviously, there have been a few changes but, for years the tower has withstood increased air traffic, population and even, Y2K. 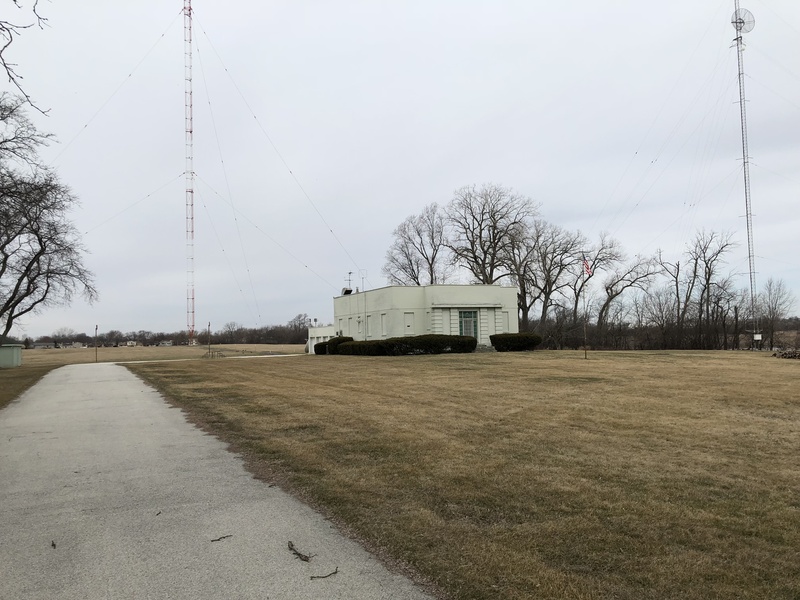 If that weren’t enough to indicate it was a wise choice, WBBM moved their own transmitter in 1942 to a site just a mile and a half south on Rohlwing Road. If you’re driving north/south on Route 53 and listening to the radio, take note of these two towers and appreciate their amazing longevity. This blog posting was written with the assistance of two sources. 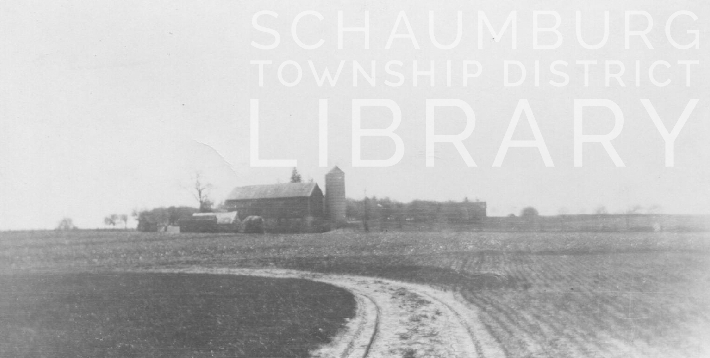 LaVonne Presley and the memories and photos from her book, Schaumburg Of My Ancestors, were a key perspective in capturing the Schaumburg Township atmosphere that WGN moved into in 1938. Newspaper articles from the period of 1937-39 that were written by Larry Wolters of the Chicago Tribune, were incredibly detailed. He was clearly fascinated with the entire process and it showed in his writing. I also thank Larry Rowan for the use of the photo he took of the WGN antenna and Art Deco transmitter building. Two for the price of one!